Al-Assad successfully ousted al-Attassi in November 1970. 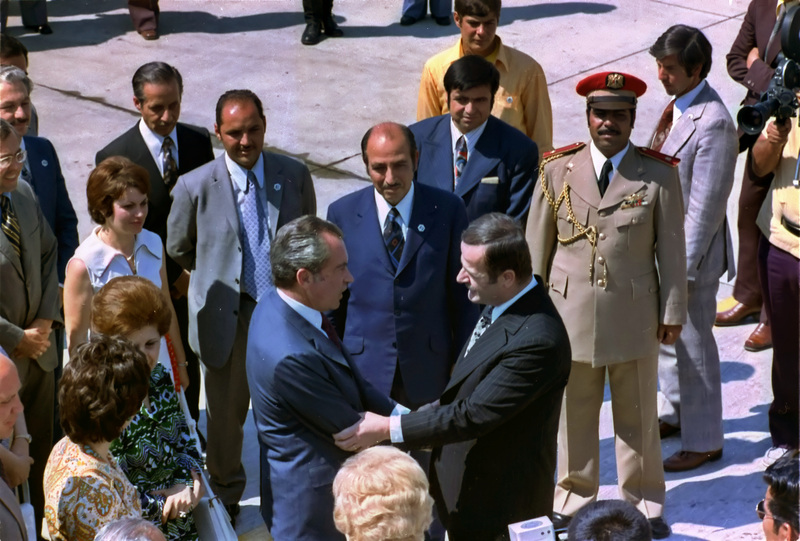 In early 1971, al-Assad was overwhelmingly elected to a seven-year term as president; he was reelected three times. 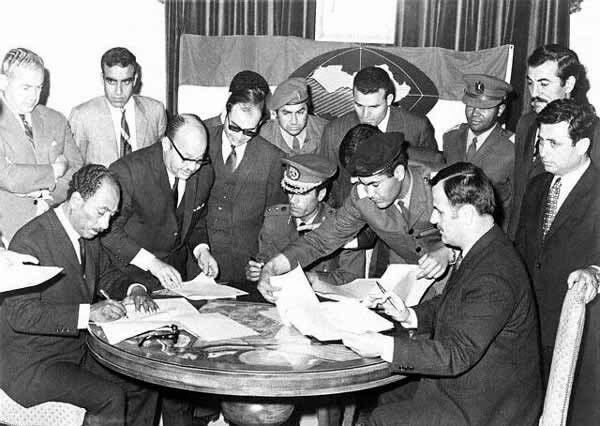 Later in 1971, Syria, Libya, and Egypt agreed to unite loosely in the Federation of Arab Republics. Syria continued to be on good terms with the USSR, which equipped the Syrian army with modern weapons. In early 1973 a new constitution was approved, and the Ba’ath party won 70% of the seats in elections for the people’s council. In July–August 1973, tens of army officers were executed after allegedly plotting to assassinate al-Assad. In October 1973, the fourth Arab-Israeli War erupted; after initial Syrian advances in the Golan Heights, Israel gained the offensive and pushed into Syria a few miles beyond the Golan Heights region. Syria (like Israel) accepted the UN Security Council cease-fire resolution of October 25, 1973, but fighting continued into 1974. In May 1974, largely through the mediation of U.S. Secretary of State Henry Kissinger, Syria and Israel signed an agreement in Geneva that ended the fighting. Under the terms of the accord, Israel pulled back to the 1967 cease-fire line and also returned the city of Qunaytirah (Kuneitra) to Syria; a buffer zone, patrolled by UN troops, was established in the Golan Heights. Since the 1970s the rise of Sunni Islamic fundamentalism has challenged Ba’athist ideology. Between 1976 and 1982, urban centers erupted in political unrest. The Muslim Brotherhood, a radical religious and political organization founded in 1928 in Egypt, was largely responsible for extremist attacks. In February 1982, the brotherhood unsuccessfully attempted an uprising in Hama but was quashed by government troops; thousands were killed. Islamic fundamentalists, however, continue to remain active. In 1976 Syria sent forces to Lebanon as part of a peacekeeping force to help end that country’s civil war. The Syrian military remained in Lebanon, and from 1980 to 1981, Syrian troops sided with Lebanese Muslims against the Christian militias. With Israel’s invasion of Lebanon in June 1982, Syrian troops clashed with Israeli forces and were pushed back. Syria was also antagonized by Israel in 1982, when Menachem Begin announced the annexation of the Golan Heights. By the late 1990s, more than 40 Jewish settlements and villages had been developed in the Golan Heights. Although Israel withdrew from Lebanon in 1985, Syrian forces stayed; they remained the dominant military and political force there into 2005. The Syrian government has been implicated in sponsoring foreign fighters, especially in support of Iranian, Palestinian, and Libyan causes. In the 1980s Syria moved closer to the USSR and espoused hard-line Arab positions. By 1990, however, as the Soviet system faltered, Syria attempted to improve relations with Western countries. That year Syria was the first Arab country to condemn Iraq’s invasion of Kuwait, and it contributed 20,000 soldiers to the coalition forces in the Persian Gulf War (1991). On the 15 th of April, 2009 the representatives of 10 Arab countries from Asia and Africa who gathered at the Constitutive Congress in Damascus under organizational assistance of the President of Asian SAMBO Federation Professor F.Pulatov, have decided to set up Arab SAMBO Union (ASU). Syria, along with Lebanon and a joint Palestinian-Jordanian delegation, became involved in peace talks with Israel in late 1991. As talks progressed between Israel and the PLO and Jordan, Syria’s insistence that Israel withdraw from all of the Golan Heights proved a stumbling block in its own negotiations. 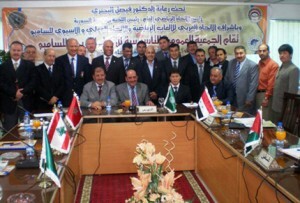 Talks broke off in 1996, but the Syrian government appeared interested in renewing negotiations following the installation of a Labor government in Israel in 1999. Talks were resumed in December 1999. After what appeared to be initial progress, discussions stalled in January 2000, when a secret draft treaty with Syrian concessions was published in Israel, leading to a public hardening of Syria’s position with respect to the Golan. In June, 2000 Assad died suddenly.